When we went to the concept board for Q-rator, we were crystal clear about one thing - it has to be the fastest way of sharing content on social media. We completely understand that as a seller, you're extremely busy and have little or no time for anything else. 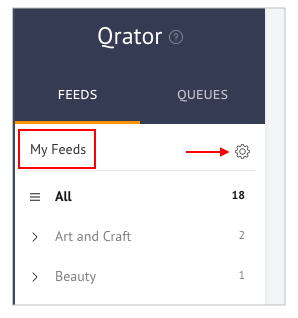 When you choose Q-rator in your dashboard, you'll land on Feeds. 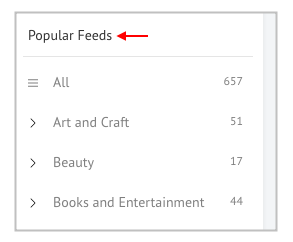 Think of Feeds as a collection of content sources, either chosen by you or suggested by us. My Feeds will show you the blogs or Pinterest boards that you're following. 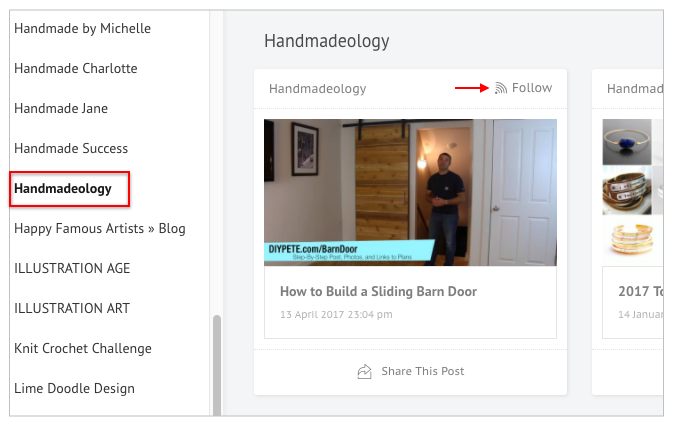 You can easily add any blog or Pinterest board by clicking on the wheel in the top-right corner of the left panel. Learn how. If you can't think of a particular blog or board to follow, right at this moment, scroll down to Popular Feeds. These are our suggestions hand-picked for you. Do have a look at this, our editors searched the web with a fine-tooth comb to come up with suitable ideas. Oh and if I haven't mentioned already, there are 650 blogs / boards to choose from. 1. Go to Popular Feeds. Scroll down to the category that you love (or maybe not!). 2. Choose a blog (under every category, we have multiple suggestions / sources listed). 3. You'll see all the articles from that source .Click on Follow in the top-right corner of any post to follow that source. Now that you're all caught up about how to discover content, let me walk you through the steps of sharing content. If you'd like to share something from any of the blogs that you're already following, go to My Feeds -> Collection -> article and then click on Share this Post. 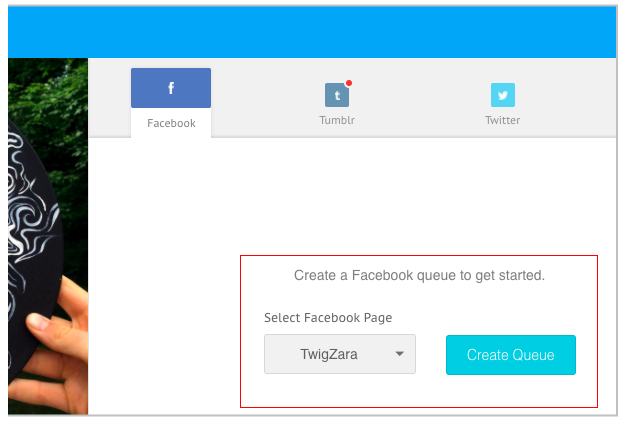 You'll be asked to create a Queue for your social accounts. 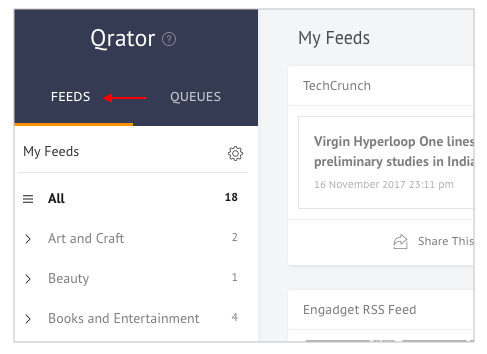 A Queue is a channel / page / board on which you'd like to share your posts. Learn more about how it works. After creating a queue, add the text, hashtags and emoticons and choose a sharing option. 1. Add to Queue: If you add a post to queue, we find the next available time slot as per the posting schedule set by you. Learn how you can set a posting schedule. For instance, If your posting schedule for Monday on Twitter is 4 pm, 5 pm and 6 pm. And you add a post to queue at 4.30, we'll see which of the next time slots (5 pm / 6 pm) are empty and schedule your post accordingly. 2. Share Next: If you choose Share Next, we'll schedule your post for the next time slot according to the posting schedule set by you. It wouldn't matter if another post is already scheduled for that slot. The already scheduled post will be pushed down for the next available time. 3. Share Now: Post will be sent out immediately. 4. Schedule Post: By choosing Schedule Post, you can sent out your post at a custom time. This is completely independent of your posting schedule. Yayi, choosing the sharing option was the last step. You're all done! But what if you want to upload an image or share a video that's not from your feeds? Well that's just as easy. Learn more about sharing custom content. Keep your hashtag list ready to save time at the time of posting. Here's how you can create and save your hashtag list. Set your posting schedule beforehand so that you can simply add your posts to queue.